Whose ready for a relaxing train ride full of refreshing beverages? 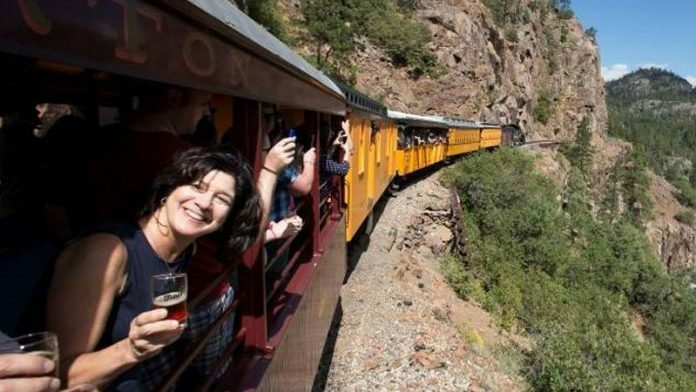 Hop aboard the Durango Brew Train that takes you through the Colorado wilderness aboard a historic 1920s-era train. The locomotive once transported gold and silver ore mined from the San Juan Mountains, but today the train serves a different purpose: to take visitors on an excellent escape into the breathtaking natural scenery. The five-hour-long journey is a historic tour that combines stunning southwestern Colorado mountain views of Animas Valley and Cascade Valley with half-hour tastings of several local craft brewers. Passengers on-board the train will get to taste drinks from BREW, Steamworks, Ska, Carver, Animas, and Durango Brewing. To top it all off there’s beer trivia! There are two upcoming opportunities to climb aboard this railroad adventure with ticket prices starting at just $109. For more information and to book your tickets, please visit the official website HERE.